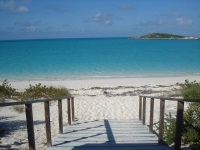 The Exumas Islands include a myriad of islands and cays that stretch for hundreds of miles. Although historically the home of the Lucayan people, who were all captured and sold into slavery in the 16th century, the islands were uninhabited for roughly a century until the arrival of British loyalists from America in the late 1700s. Owing to the islands' long stint free from human habitation, they were often used as hideaways by pirates. The largest islands, Great Exuma and Little Exuma, are now home to a small community of several hundred island inhabitants, who farm the land and welcome tourists. Visitors usually arrive by yacht, as these islands offer legendary sailing opportunities. Even if travellers arrive without sails, they may be tempted into hiring a boat to make the most of the inviting waters. Most cays are edged with towering palm trees and expanses of white, powdery beaches. The surrounding reefs have magical, underwater gardens that draw scuba divers and snorkellers. The main destination for divers is the Exuma Cays Land and Sea Park, a 176-square-mile (456 sq km) natural underwater preserve that can only be reached by seaplane or boat (charters can be arranged through the hotels). Many of the smaller islands are owned by the likes of Nicolas Cage, Faith Hill and Tim McGraw, and Eddie Murphy.